Over the past few posts we’ve looked at how trees at different stages of development provide opportunities to learn different sets of skills. The same is true for mature bonsai too. Can I do maintenance work? Can I do cutback to maintain the silhouette? Can I do show prep? Can I select a show pot? Can I create a meaningful display? These questions take on extra weight for well-developed trees as these tasks typically don’t change significantly over time. Starting earlier in the process offers opportunities to develop trees and then maintain them once they’ve reached maturity as bonsai. With trees that are already established, some form of maintenance and incremental improvement is the focus every year. As maintenance work can be time consuming, I’ll think twice about how many trees of a given variety I have and how much I like doing the maintenance work for a given species. Junipers require annual cutback and regular deadwood treatments. Deciduous trees require relatively frequent repotting and periodic cutback. Some tasks like the pinching of Japanese maples or the decandling of pines needs to happen with 1-2 week windows for optimal results. If I know I’m generally unavailable or busy during certain times of the year, that may affect how many trees of a given variety I can add to my collection. The juniper below is a good example of a mature tree that needs a substantial amount of work. The tree is healthy and the canopy is full – a bit too full. Before long, the tree will need a substantial thinning and some branch selection to balance the silhouette with the trunk. Where the live vein enters the soil, there are good surface roots. The deadwood goes down to the soil line on the other side of the trunk. Over time the deadwood will support algae growth – the green-hued growth that appears when the deadwood stays wet. To preserve the deadwood, I’ll need to remove the algae with a brush or blast it away with a spot remover and re-treat the wood with lime sulfur. Looking up into the canopy, it’s easy to see that not a lot of light can make it through the branches. The tree will need thinning to maintain the desired silhouette. The current branch density is too high – time to thin! 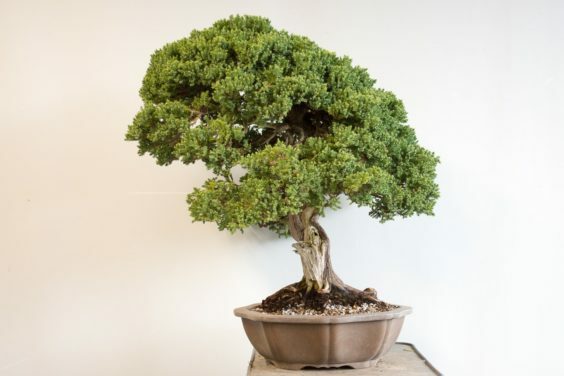 Apart from all of the considerations we may put into whether or not we add a tree to our collections, the most important factor remains how a given tree makes us feel. If a tree makes us feel great, it’s likely a good fit. And if something changes over time that makes the tree a less compelling part of our collection, it may be that the tree is just right for someone else’s collection.